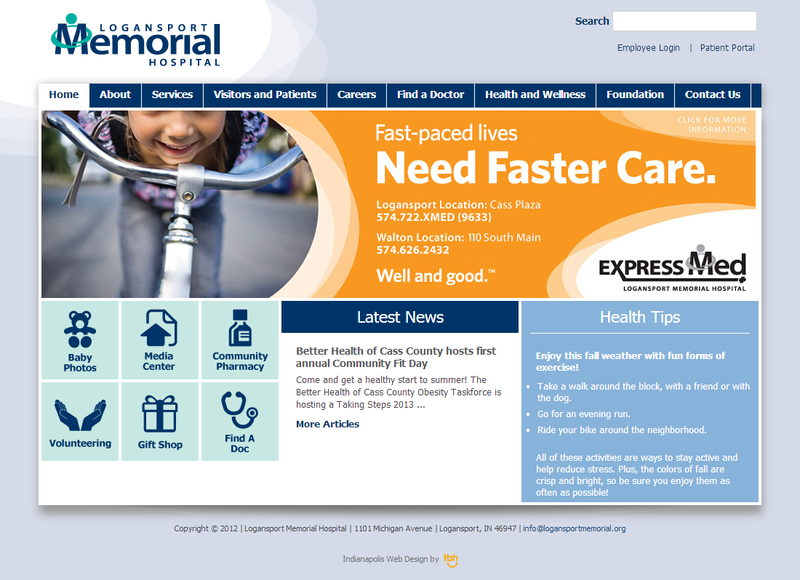 We launched an updated website for Logansport Memorial Hospital today. 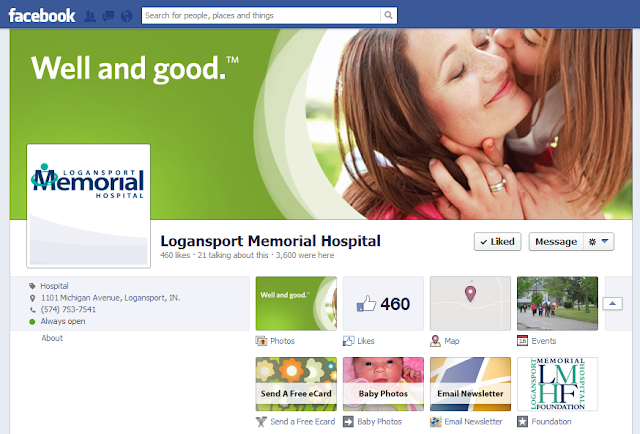 TBH Creative has been working with Logansport Memorial Hospital since 2011. In 2012, we upgraded their technology as a primary focus. 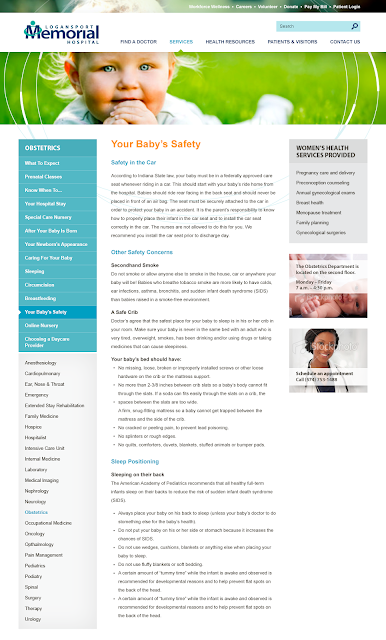 We gave them a quick facelift at that time, but planned for a more thorough redesign and focus on content in 2013. The new website design is fresh. It incorporates their new brand with circle elements, strong photography, and inviting bold colors. Our main goals were to highlight physicians and show that Logansport Memorial Hospital is the best hospital for their local community and offer many services. 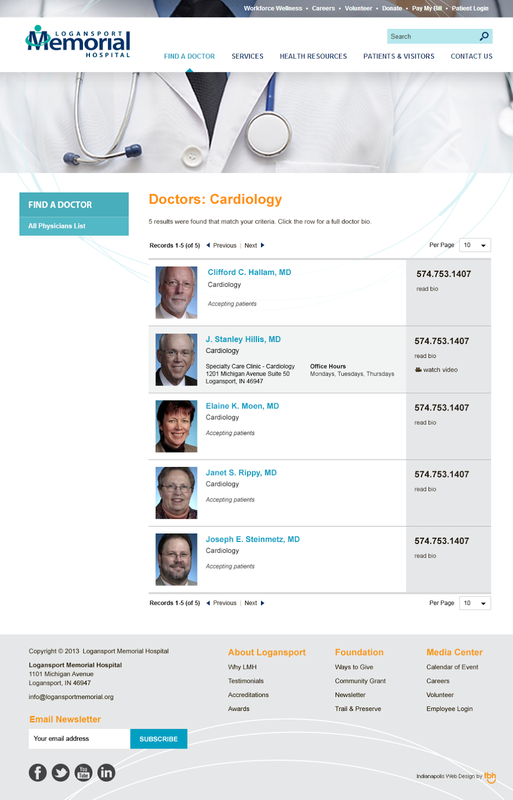 We highlighted physicians through an improved physician directory and a widget featuring physicians right on the home page. We restructured and organized the site architecture for a better presentation of their depth of services. You will also notice a large mega menu for Services with easy 1-click to all of their services. We invite you to visit their new website at www.logansportmemorial.org and view some of the new screens below. 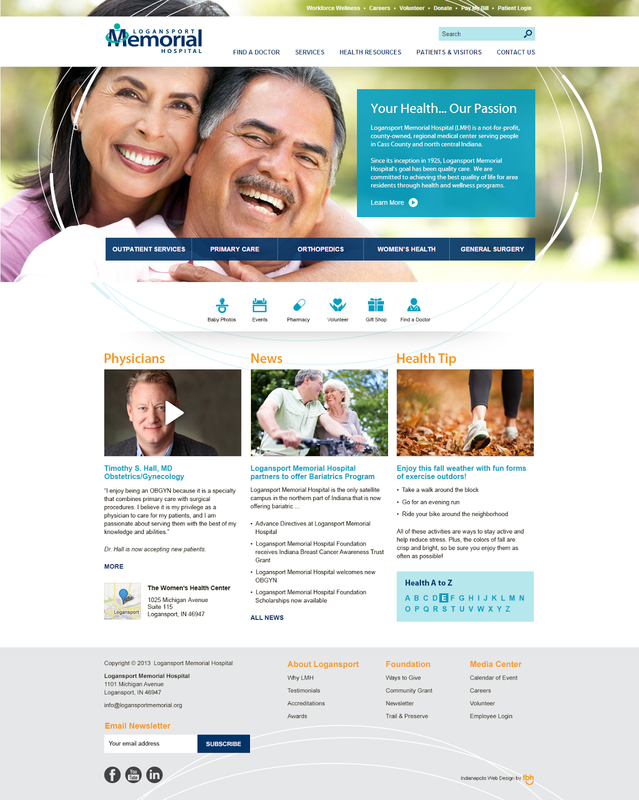 The home page focuses on the main services at the top and highlights physicians, news, and health 'tips'. The physician directory is an important function of the new website and allows quick searching of the physicians. The physician bio page highlights a large photo of each physician and relevant biography information. For interior services pages, we designed the page for long content if necessary as well as pertinent information highlighted in the right column. The photos on interior pages were still a primary design element adding interest and appeal in the new design. 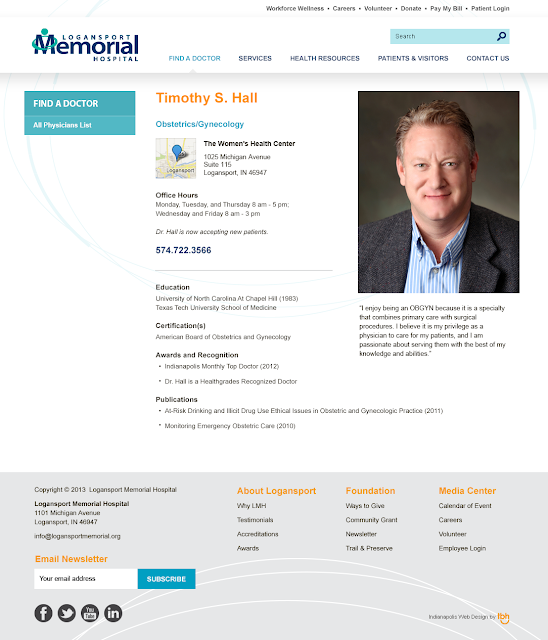 In addition to the website design, TBH Creative was hired to help Logansport Memorial Hospital begin an email marketing program. As part of the first steps, we created an email newsletter template that was designed and coded for flexibility. 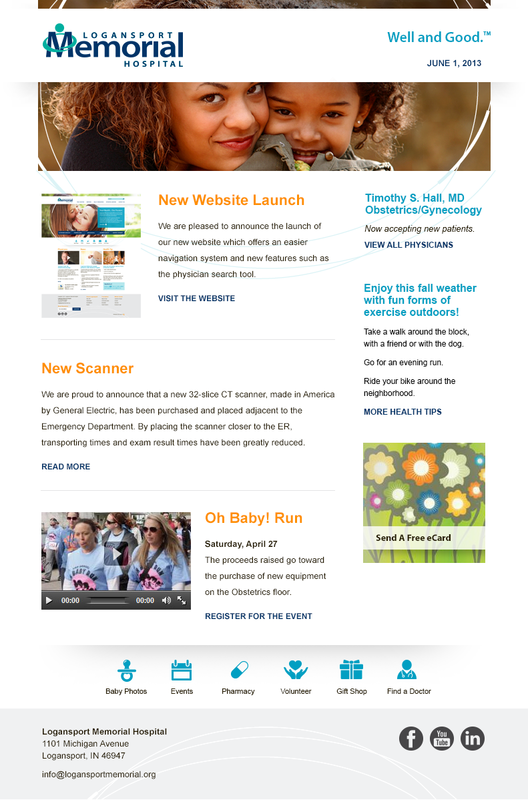 It was important that the newsletter match the new website design and brand while also being easy to manage. The flexible email newsletter template will be used to build relationships with the community and share health tips and hospital news. Logansport Memorial Hospital understands the importance of social media. As part of their social media marketing, we helped them develop and evaluate a strategy for Facebook. We helped them merge their confusing multiple Facebook pages, develop a plan of action with samples of posts and techniques, add custom tabs to important pages within their website, and also brand the page to match their new marketing and overall brand. This page shows events, the newsletter, information and how to send a card. In 2012 (Phase 1,) we upgraded their website with a simple facelift and focused on upgrading their technology through our content management system. 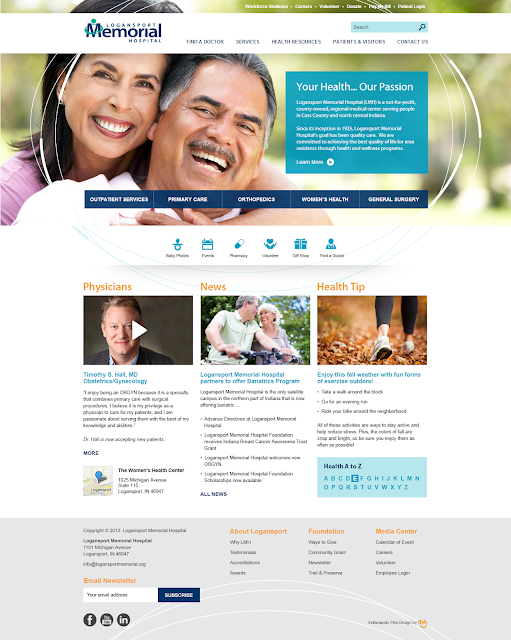 In 2012, as Phase 1, we upgraded their website with a simple facelift and focused on upgrading their technology. Stay tuned in the coming months for our next improvements of a responsive views. "I have appreciated TBH Creative's expertise and guidance as we have navigated through a website redesign at Logansport Memorial Hospital. They are knowledgeable, detail-oriented, and very creative. I trust their work and opinion on any website endeavor that we pursue, and I look forward to partnering with them for many years to come." Logansport Memorial Hospital is a not-for-profit, county-owned, regional medical center located in Logansport, Indiana—the largest and most comprehensive health care provider in Cass County.